The Ducks reached a new deal with Tim Jackman. 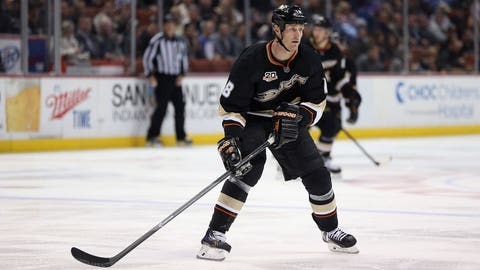 Forward Tim Jackman has agreed to a one-year, $637,500 contract extension with the Anaheim Ducks for next season. The Ducks announced the deal Saturday. Jackman has fit in well in just 20 games with the NHL-leading Ducks, who acquired him from Calgary for a sixth-round draft pick on Nov. 21, 2013. The rugged right wing has two points and 48 penalty minutes with Anaheim, his sixth NHL team. He has played several roles for the Ducks, filling in on multiple lines and providing physical defensive play. Ducks coach Bruce Boudreau also said center Mathieu Perreault’s upper-body injury is likely to keep him out of their home game against Carolina on Sunday night. Perreault was hurt early in the third period of Anaheim’s 1-0 win over St. Louis on Friday.